Magnetic ink character recognition (MICR) technology, deployed to validate the originality or legitimacy of paper documents, specifically checks, has been seeing steady uptake for their ability to facilitate fast and secure document management. End-users such as government, retail, transportation and banking, financial services and insurance (BFSI) are contributing to their demand. They rely on MICR technology for high-quality and cost-effective financial document and check printing. Dual magnetic reader and hybrid devices are the major recognition technology which is expected to generate demand for magnetic ink character recognition devices over the forecast period. Posing a roadblock to the market, on the other hand, is the steep cost of MICR readers and printers. Emergence and subsequent popularity of digital transactions has also served to crimp demand in the market. As per a report by Transparency Market Research, the global market for magnetic ink character recognition devices market will likely register a 1.6% CAGR from 2017 to 2025 to become worth US$665.6 mn by 2025. Depending upon the type of technology, the global magnetic ink character recognition (MICR) devices market can be broadly segmented into MICR printing and recognition technology. The MICR printing technology can be further divided into ribbon encoding and non-impact MICR printing. The recognition technology can also be divided again into waveform readers, matrix readers, dual magnetic reader, and hybrid device. Of the two, the segment of recognition technology accounted for over 60.0% share in the market in 2016 due to rising demand for secure and efficient check and financial document processing across the industries. The MICR printing segment, on the other hand, is expected to see reduced growth in the next couple of years on account of declining volume of checks as customers adopt more convenient payment methodologies. Based on end-users, the global magnetic ink character recognition (MICR) devices market can again be divided into government agencies, banks and financial institutes, business organizations, and others including retailers, etc. Of them, government agencies will likely grow at a steady 2.0% CAGR in the forecast period owing to rising usage of MICR technology by them to accelerate documents sorting. 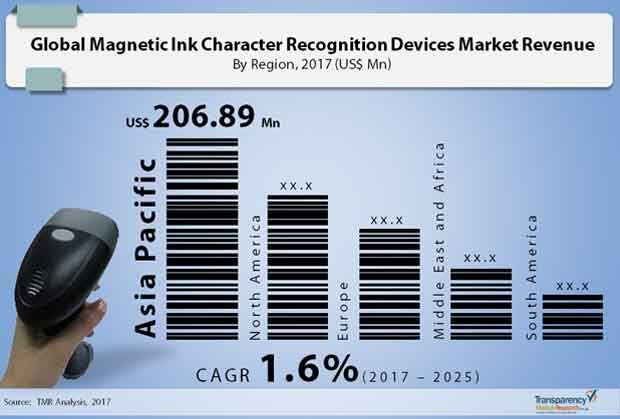 From a geographical standpoint, Asia Pacific leads the global magnetic ink character recognition (MICR) devices market. In 2016, its dominant share came to about 35.0%. Increasing uptake of MICR technology for printing and scanning documents or checks across the region has served to boost its market. For instance, checks continue to play an important role in India’s retail payment system, in which around 4.5 million inter-bank checks are cleared every day. MICR devices help to increase speed of check processing. In addition, the capability of MICR devices to authenticate the validity of financial documents is leading to their rapid adoption in financial institutes, thereby further benefitting the market. By registering a CAGR of 2.3% in the forecast period, the revenue in Asia Pacific market is expected to reach US$247.97 bn by 2025. The market in the Middle East and Africa, though having a relatively lower share in terms of size, is predicted to trail Asia Pacific vis-à-vis CAGR. Rising thrust on effective management and control of document printing and scanning process across the region will result in a 1.7% CAGR during the forecast period. Some of the prominent participants in global magnetic ink character recognition devices market are ACOM Solutions, Inc., Canon, Inc., Hewlett Packard Company, Epson America, Inc., Murni Solusindo Nusantara, MagTek, Inc., Rosetta Technologies, Inc., Source Technologies, Troy Group, Inc., Xerox Corporation Ltd, Uniform Industrial Corporation, and ZIH Corp. This report provides an analysis of the global MICR devices market for the period from 2015 to 2025, wherein the period from 2017 to 2025 comprises the forecast period and 2016 is the base year. Data for 2015 is provided as historical information. The report covers all the major trends and technologies playing a major role in the growth of the MICR devices market over the forecast period. It also highlights various drivers, restraints and opportunities expected to influence the market’s growth during this period. The study provides a holistic perspective on the market’s growth in terms of revenue in US$ Mn, across different geographical regions namely North America, Europe, Asia Pacific, Middle East & Africa and South America.